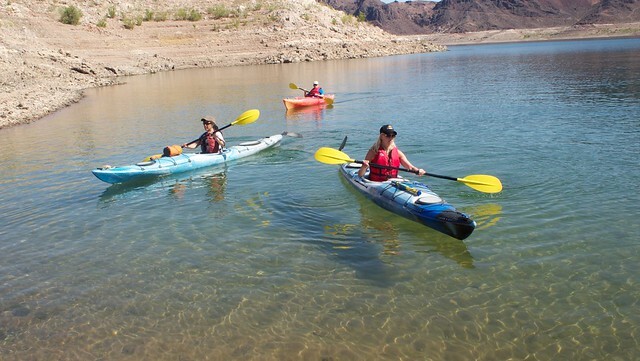 Next up in Nevada was a half day kayak trip on Lake Mead with Desert Adventures. 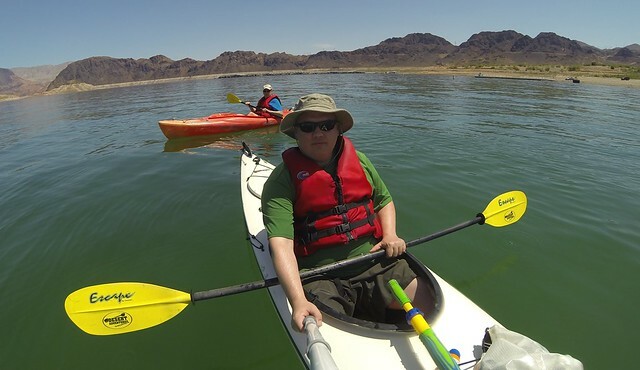 Once again, we had perfect weather and met with our guide, Reid and headed to Lake Mead which is a national recreation area that extends across Nevada and Arizona. The lake is the largest man made reservoir in North America and is a result of the building of the Hoover Dam on the Colorado River. 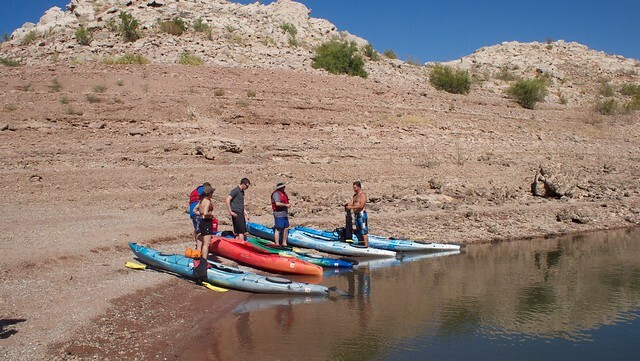 Once we had the kayaks unloaded, we set out to explore. The scale or the lake is somewhat deceiving as our first destination was what appeared to be a small island but was actually quite large and took a bit of time to reach. On the way, we passed a number of concrete structures that were left over from the construction of the dam that had been underwater for nearly 50 years. 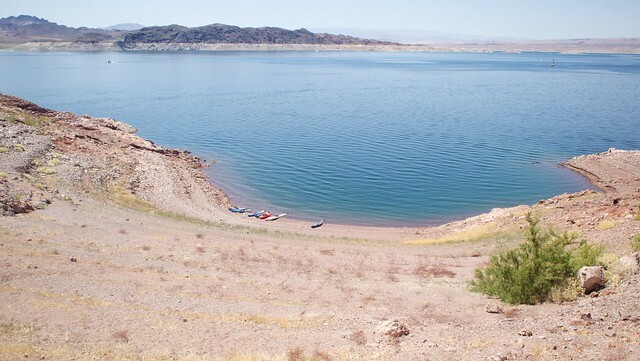 In recent years, the water level has dropped on the lake due to high demand and drought. You can see where the water level was from the white ‘bathtub ring’ visable all around the lake. Once we arrived at the island, we trekked up to the top. We couldn’t see it when we started but at the top was a little cave which was our destination to stop and eat lunch. The views from inside the cave were stunning. 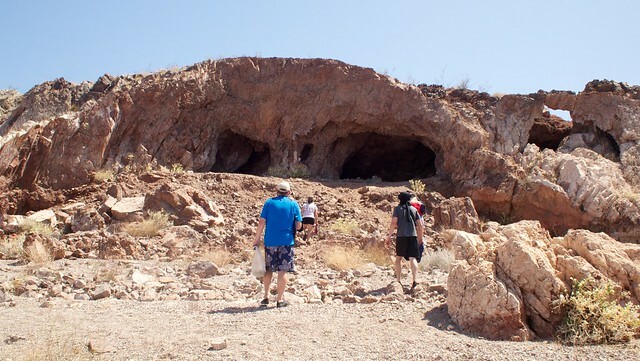 Funny enough, everyone had full bars of cell service inside the cave. Lots of instagramming occurred. After lunch, we headed back down to the kayaks and continued around the lake. It was starting to get quite hot out so Reid took us to one of his favourite swimming holes. After a quick dip, we went back to shore to pack up the kayaks. Throughout the trip, Reid had hinted at a surprise after we got out of the water. We had no idea what was coming as we drove a few minutes up from the boat launch. After turning into a residential area, we stopped at a park overlooking the lake we had just kayaked around. 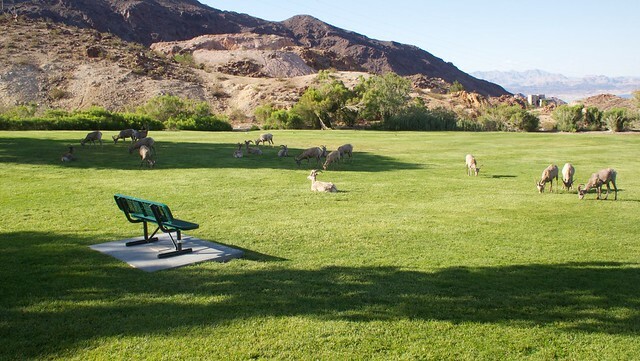 As we made our way through the park, past the playground, we saw what the surprise was. 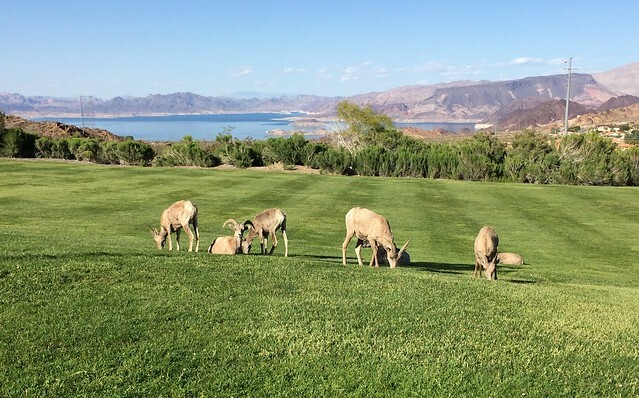 With Lake Mead in the background, an entire herd of big horn sheep were holding court on the grass and baseball diamond. It was a great way to end a fun afternoon of kayaking. 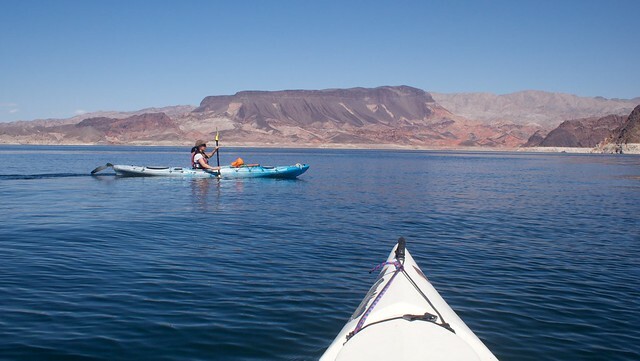 More photos of Lake Mead and the kayak adventure can be found on my Flickr. Stay tuned for the next instalment in the series to learn about more of my adventures in Nevada.